The author and her able assistant tending to the newly-planted home veggie garden. In our home town of Cradock in the Eastern Cape, the power goes off quite often. Most times, it has nothing to do with Eskom and load-shedding – the problem is more about ageing infrastructure that is badly maintained and the odd hadedah shorting out a line. Then there’s the water. Sometimes a pipe bursts or the pumps fail and the high-lying areas are dry for days on end. What do you do? You either go off your rocker or you go off the grid. There are many ways of going off-grid via solar panels, petrol-driven generators, solar water heaters and water pumps attached to rain tanks. But we’ve hesitated to make the investment, because efficiencies are increasing and costs are coming down all the time. In the meantime, we’ve opted for fairly mundane, commonsensical ways of working around the problems of power and water supply. We used to greet each stoppage with dismay and helpless anger. Then we took a deep breath (after about seven years of home-rage at the lack of service delivery), looked around and discovered some very affordable basic work-arounds. Read on, tell us what you think and what your domestic solutions are – besides emigrating to Mars. 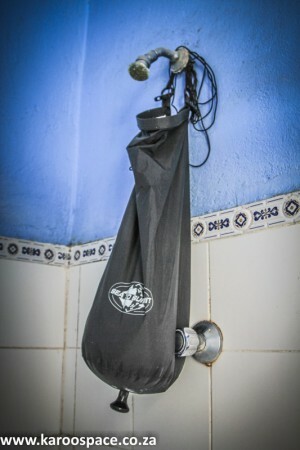 A simple 10-litre camping shower for water outages. No one can live without water for very long – and yet outages can occasionally last for days. Our house already had one corrugated iron rain tank when we moved here, but that’s become very rusty and will soon fail. So we’ve added another – a 2 200 litre JoJo tank and use its water for flushing toilets, washing and watering our veggies. 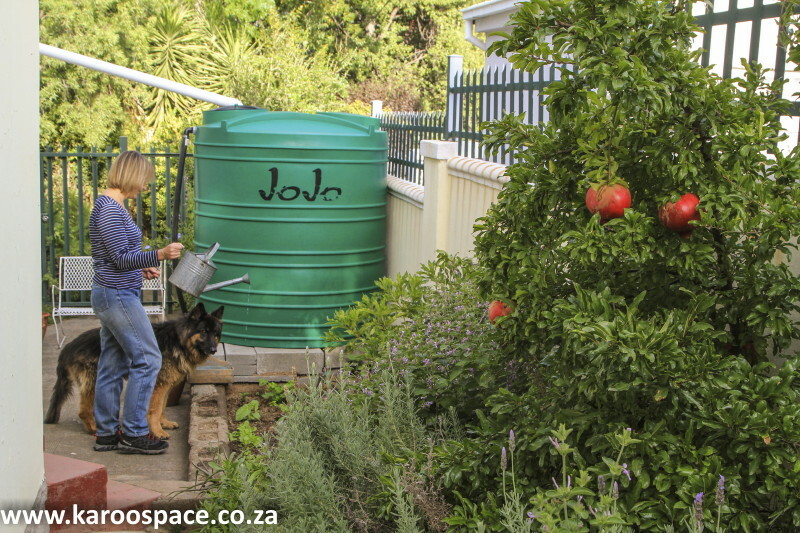 Expect to pay R1 000 per 1 000 litres for a rain tank, on average. When it doesn’t rain, we refill the tank from town water when we have it. To keep clean, we have a simple camping shower which takes 10 litres at a time. More than enough for one. Usually we don’t even use a fraction of that. 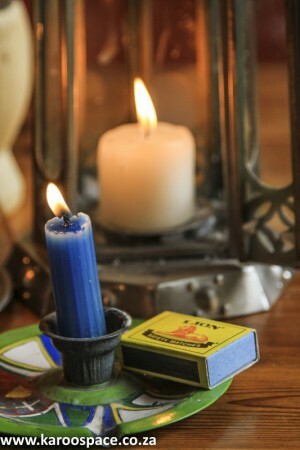 Candles will never fail you. We use candles and torches for stop-gap lighting, and keep our solar lamps charging on a sunny ledge until needed. We keep our laptop, portable radio and cell phones charged. And if we forget, we have a simple old solar charger and small power bank for emergencies. Like many South Africans, we have an outdoor braai area which is always handy for cooking or heating. We don’t have a gas stove, but we do have a gas bottle and an attachment so we can at least cook a meal quickly and keep it warm in a Wonderbox, or boil some water. And then there are flasks to keep said water hot and jaffle irons to make toasted sandwiches over the flames. There’s a fireplace in the lounge so we can keep warm in winter. The mohair blanket, wool duvet and Pep store blankets have all been great investments, as has the insulation in the roof. 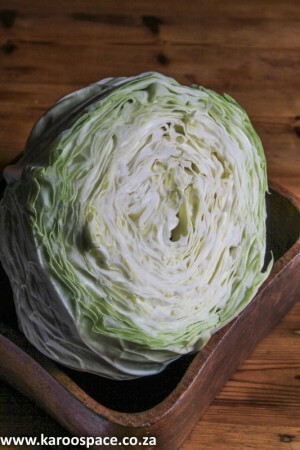 The noble cabbage at R10 a head direct from the farmer. Fantastic value. I am officially the world’s most useless gardener, but I have recently found that spinach and rocket are very forgiving and will grow from seed with little provocation. I also learnt on Facebook that the bottom part of celery can be put in water until little roots form, and then they can be planted in the ground. The same with spring onions, sweet potatoes and even beetroot. All our grass clippings and veggie cuttings go towards compost. Most houses in small towns have fruit trees (ours had peach, pomegranate, apricot and grape vines). We added a so-far fruitless avocado tree, an orange, a lemon and a lime tree, along with rosemary, oregano and parsley. We’ll definitely throw a guacamole party when the first avo fruit appears! Late in my life I’ve learn to love cooking with cabbage – it’s cheap (R10 from the local farmer who drops off three for us every week). It even helps to prevent cancer, say the experts. Living in the platteland has many perks – among them sourcing your meat directly from farms. Many farmers have small abattoirs or meat rooms and will sell you a whole lamb or even venison in winter at a very good price. Cut out the middleman and club together with friends for the best deals. Breakfast cereals and nuts are expensive but Cradock Saad sells sunflower and other edible seeds at way better prices than the supermarkets. Want to live a more human scale life? Move to a small town. When I lived in the city, I used to use all kinds of cleaning detergents. Not good for the pocket, and definitely not good for the planet. Nowadays, I mostly use bicarbonate of soda and white vinegar. 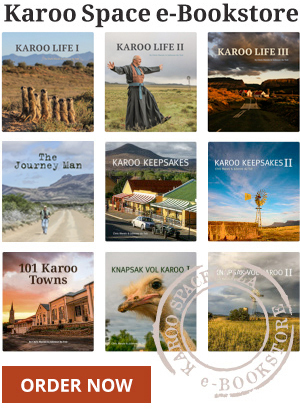 When the power goes off, we do what families in the Karoo used to do for decades before Eskom power arrived – we read by candlelight or we make music. The local farming Co-ops have hardy clothing (great boots, socks and jackets) at very good prices. 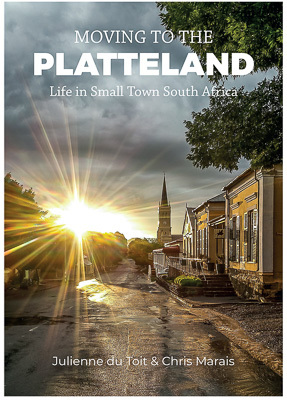 For more off-grid tips, case studies and anecdotes, buy Moving to the Platteland in print or ebook. I so enjoyed reading this article by Julienne, so inspiring !It made me feel motivated to be more thankful for what I have and her sharing of the enjoyment of their life in Cradock !!! I am glad I discovered your blog Julienne. Me and my husband just quit our city live and moved to a house in the countryside in north of Romania. We have a very similar setup as yours I was wondering if you didn’t think of installing solar panels as the benefits are amazing. We have a very small system (DIY) and it’s perfect for off-the-grid homes. Very interesting article! Also interesting is the fact that only ladies have commented thus far – where are the men? Anyway, I recently inherited a small farm in the northern Cape and as it doesn’t offer financial viability, I have wondered about opening it up as a green lifestyle space. Don’t know if such a concept could be viable in any way… Your thoughts, ladies? Richard I think this is a brilliant idea… will definitely work. The demand I have found for this just in my area is huge… which is why I have decided to see if there is anything I can find on google. If you can do this… go for it! I have been in tourism and hospitality as well as volunteer projects, gap year projects for long enough to be able to tell you to really consider doing this, ESPECIALLY with the state SA is in currently and the road we are taking. Dee, in my haste I assumed that you were the owner of this website, so I duly sent an email to Julienne! Proof once again that men can’t multitask! Would love to take this conversation further.